Claremont, Calif. (September 3, 2014)— New research by Pitzer College Assistant Professor Lars Schmitz reveals ancient animals may have become active at night 100 million years earlier than previously thought. In “Nocturnality in Synapsids Predates the Origin of Mammals by Over 100 Million Years” in Proceedings of the Royal Society B, Schmitz and co-author Kenneth Angielczyk explain how analyzing tiny bones in the eyes of prehistoric mammal relatives led to this ground-breaking finding. Schmitz teaches biology at Pitzer’s W.M. Keck Science Department. Schmitz and Angielczyk’s findings will be useful to researchers studying the visual systems and behavior of living mammals and may spur the rethinking of some long-held ideas, such as mammals becoming nocturnal to avoid competition with dinosaurs. Today, most living mammals are active at night. It has long been thought that the transition to nocturnality occurred at about the same time as mammals evolved, around 200 million years ago. Schmitz and Angielczyk, associate curator of paleomammalogy at the Field Museum of Natural History in Chicago, used eye and eye socket bones to reconstruct the light sensitivity of the eyes of 24 species of ancient mammal relatives, called synapsids, that lived during the Carboniferous to Jurassic periods. Their results indicate that nocturnal activity evolved in synapsids more than 100 million years before the appearance of mammals. With funding from the Geology Department of The Field Museum, Schmitz and Angielczyk scoured museum collections in the US and South Africa to find synapsids’ delicate eye bones intact. Using a statistical technique developed by Schmitz, they then compared the data from those synapsids to a large dataset of similar measurements for living lizards and birds that have known daily activity patterns. 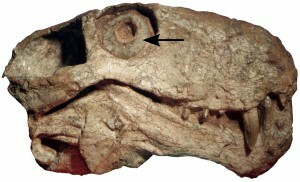 The technique revealed that the eyes of ancient synapsid species likely spanned a wide range of light sensitivities. The oldest synapsids in the dataset were found to have eye dimensions consistent with activity at night, a discovery that raises the possibility that the common ancestor of all synapsids was nocturnal. Proceedings of The Royal Society B is the Royal Society’s flagship biological research journal, dedicated to the rapid publication and broad dissemination of high-quality research papers, reviews and comment and reply papers. The Royal Society is a self-governing Fellowship of many of the world’s most distinguished scientists drawn from all areas of science, engineering, and medicine.